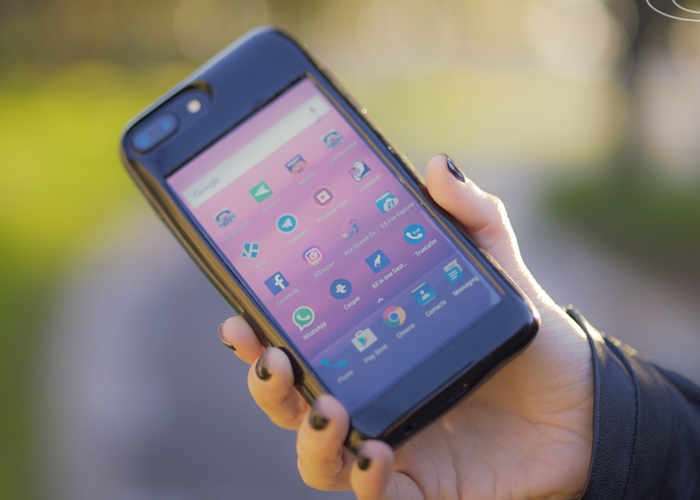 If you use both iOS and Android smartphones but would prefer one device which combines the two, you may be interested in a new smartphone case called the Eye which basically adds an android smartphone to the rear review iOS device. Watch the demonstration video below to learn more about the Eye iPhone case which has been created by ESTI based in Israel. Adding a 5″ AMOLED 1920×1080 resolution Android powered screen to the rear of iPhone 6 and iPhone 7 phones. You’ll be able to wirelessly charge your iPhone with home chargers that support Qi wireless charging and commercial ones including those in Starbucks, McDonalds, IKEA wireless charge furniture, GMC, Toyota, Lexus, Jeep, Audi, BMW, Chrysler, Cadillac, Kia, and Chevy select automobiles. For more information on this interesting project jump over to the Indiegogo crowdfunding website via the link below.